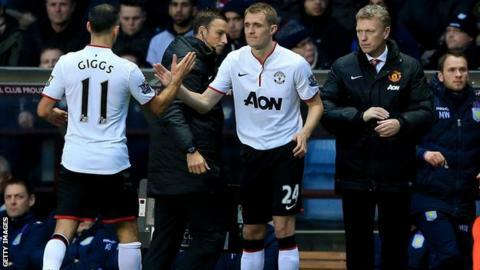 Manchester United midfielder Darren Fletcher says he is eager to help his side regain their form after recovering from his long-standing illness. The 29-year-old struggled for three years with a chronic bowel problem and returned after nearly 12 months out in Sunday's 3-0 win at Aston Villa. "I want to help us win to bring back the success we are used to," he said. "At least if they are winning you enjoy the moments. It is a lot more difficult when we are not." United have endured a tough start to the Premier League season under new manager David Moyes, but the win over Villa has moved them up to eighth and 10 points off leaders Arsenal. "We need to go on a winning run and put ourselves in a position where people are saying we are still there," added Fletcher, who came through the youth ranks at Old Trafford. Fletcher was diagnosed with ulcerative colitis in December 2011 but made 13 appearances for club and country in 2012-13, the last as an 89th-minute substitute in the 4-3 victory over Newcastle on 26 December, before the problem flared up again. The Scotland international revealed his struggle with an illness that required three operations and almost ended his career. "I couldn't leave the house," he said. "Simple stuff, like taking my kids to the park, going for a meal with my wife. "The nature of the illness meant I just couldn't do it. "There was a day in May when we said 'this is it'. Once I came out of that operation I would know whether it had worked or not. "There were no guarantees. If the operation was not a success there was no way I would be able to play football and my everyday life would have been very difficult. "It was very emotional. There was a lot of fear and anxiety." Now back in the action, Fletcher is hoping to feature again in Wednesday's League Cup quarter-final with Stoke. "I don't want to take it easy. I've done enough of that," he added.